After my last post, I’ve decided to expand this theme with a series of posts, as many as it takes to deal with this in some depth. This post will largely recapitulate my last comment to Ju-hong on why nutritional studies are harder to get right than other studies. In the process, I will introduce the statistical/epidemiological concepts of interaction and confounding (not the same!). Don’t worry, I promise to make it intuitive! Smoking really really really increases your risk of lung cancer. As in, if you smoke, you might be 100 times more likely to get some kinds of lung cancer. This makes the association easy to find. You don’t need a million study subjects, and you don’t need to worry about getting all the details of your study right – if you do any study, you’ll find an effect. If you get the details wrong, you might estimate the risk at 10-fold, or 1000-fold, but you won’t miss the general direction of the effect. Can I see a show of hands for who thinks eating grapefruit will give you 100 times the risk of getting breast cancer? I didn’t think so. Rather than expect an effect 100-fold or even 10-fold, we expect an effect of maybe 10% increased risk (1.1-fold), or 50% (1.5-fold) if the effect is really strong for a food item. Certainly less than 2-fold. This is obvious – most stuff that we eat is not downright toxic, so the effects are subtle. Subtle effects are small and hard to measure. It takes a huge study with lots of participants, and if you have even a small amount of error or bias, the error will overwhelm the actual effect (as explored in the last post). So it’s hard to detect the effects of diet on health, and even harder to be sure that you have. Let’s imagine for a moment that our suspicion is right, and high estrogen causes breast cancer. But hormones are complicated – maybe very low levels of estrogen also cause breast cancer. In this case, the effect of the estrogen we take in through grapefruit will depend on what else we eat. Maybe someone who eats lots of soy (full of phyto-estrogens, yay!) 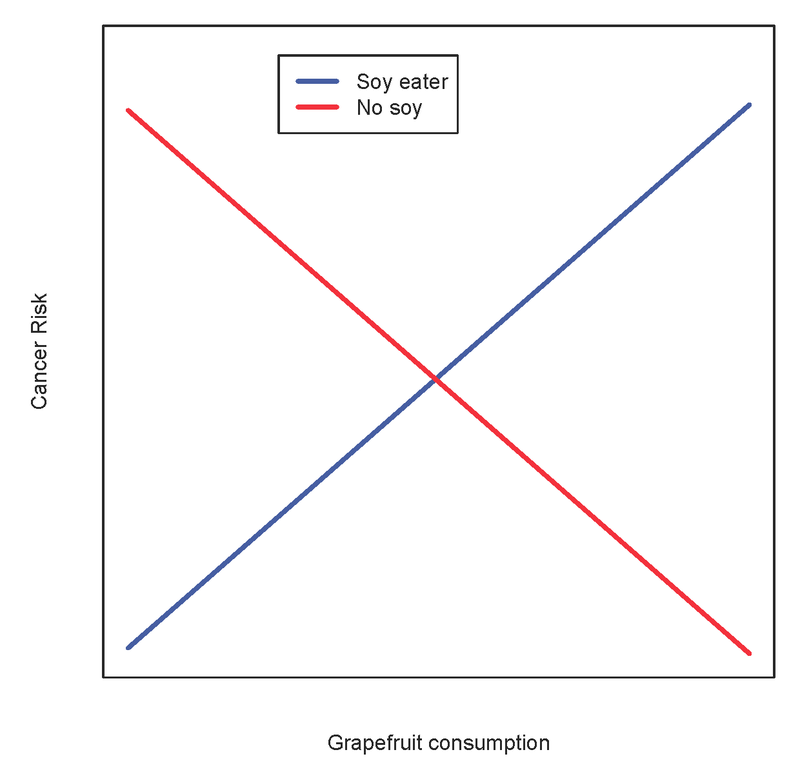 and lots of grapefruit will have an augmented breast cancer risk, as will someone who eats lots of grapefruit and lots of non-organic beef (full of added estrogen, not yay 😦 – don’t you love how we market some estrogens and market against others?). But if you eat lots of fish (not full of estrogen) and grapefruit, maybe you’ll have lower risk than if you eat fish and no grapefruit. OK, that’s a lot of hypotheticals. But those hypotheticals are plausible hypotheticals – we can’t discount them. We also can’t discount that, once in the body, estrogen levels are regulated. They’re regulated by lots of things, including the immune system. And lots of things we eat affect our immune system. Many antioxidants, in addition to being antioxidants, control aspects of immune function. Omega-3 fatty acids too. So pretty soon we realize that if we want to predict how diet affects someone’s estrogen levels, we had better measure pretty much everything they eat, and know how these things interact at different levels in the body. And we’re a long way from knowing that. Of course, if we know which interactions are important, we can include those and leave out the rest. But the problem is we don’t: maybe cinnamon consumption completely mitigates the effect of grapefruit, but only in people who also eat lots of zucchini and not too much shrimp. We just don’t know where to begin. So in the end, we may detect an effect of grapefruit on breast cancer, but it’s an average effect for the people in out study. The study gives us next to no information on what to recommend, since many people may be harmed if they don’t eat grapefruit, and the particular effect we found may depend a lot on what people in our study were eating. Interactions are when real effects change depending on conditions. Confounding is when something that appears to be a real effect isn’t really – it’s just a correlation between two other things. For example, imagine that people who eat grapefruit also eat brown rice, and that brown rice causes cancer. Unless we include brown rice in our model, it will appear as if grapefruit causes cancer, even though it doesn’t. So we need to control for brown rice in order to see what the real effect of grapefruit on cancer might be. Brown rice is a confounder. Unfortunately, as with interactions, almost everything we eat might be a confounder. Most items in the diet will be likely to co-occur with many other items in the diet. People who eat Doritos will also drink Coke. People who eat lobster will eat butter and lemon. People who shop at Whole Foods are likely to eat hormone-free beef, organic asparagus imported from Chile, and microwaveable soy patties. Or, rather, we spend lots of money, draw lots of unsubstantiated conclusions, spread these conclusions far and wide through the media, and encourage unhealthy fad eating. I think it should be more about how to conduct researches better than saying all nutritional studies are useless. We can’t quit it altogether just because it’s simply impossible to conduct research on these subjects. Pretty much all science-related discipline was impossible to do before but now we can. What we do in the meantime is to do best with what methodology we think is best, be careful with how to interpret the results and cumulate our knowledge that can build up to a good reliable theory. I agree we can’t count on juicy articles about grapefruits or blueberries or shrimps from newspapers, but at the same time, we learned that chemicals in salami can increase the risk of cancer, dark greens boost calcium and iron etc, which must have come from nutritional studies. So we believe spinach make us healthy, but who knows, it might also be cancelled out if you’re eating something else that we don’t know about yet. But we’re not pointing finger at someone who first said spinach was good for us. Epidemiologists learn confounding errors and interactions in epidemiological method 101 – it’s not that they don’t know it, but I just think they’re trained too much to think with a check-list. The worst is media who publishes without knowing the limits of these studies. + I would happily agree to participate in the public health survey at any time-!